I’ve briefly mentioned The Citadel during one of our riding-around-getting-lost postings, but I finally signed up for a proper tour. Ron had expressed interest in going on a guided tour as well, but said he was going to wait until the Fall. Not absorbing the gist of his reasoning, I blindly went through with my plans, signed up and traipsed over to CSA on Tuesday morning where the tour bus would pick us up. There were only six of us on the tour, a woman whom we’d met on the Ancient Christianity tour (the Oil-Wives, I’m finding, take advantage of a lot of the tours… of course, the same could be said of certain Dip-Wives, too), plus her sister visiting from Shanghai, a retired “Beer Guy” (his phrase) and his visiting friend, me, and a 70-year-old American woman who decided to hop a bus from Jerusalem because her visas had expired so she was spending a few months exploring the wilds of Cairo. The Citadel’s history is long and varied. 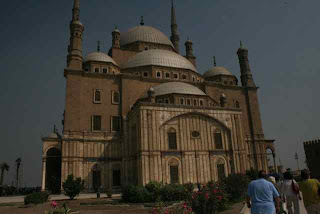 It was initially built on the limestone cliffs above Cairo in the late 1100s by Saladin to ward off the Crusaders. For the next 700 years, Egypt’s rulers made it their home, adding on and rebuilding throughout the centuries. Following Saladin’s reign, the Mamlukes, who were prisoners of war from Turkey and brought to Egypt as slaves, took over the Citadel, followed by the Ottomans, then Napoleon in 1798. Following Napoleon, Mohammed Aly Pasha took power and destroyed all but one Mamluke mosque, which he apparently used as a stable. 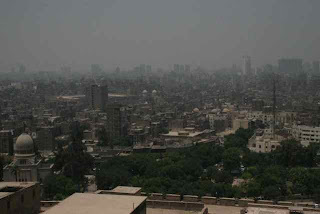 He destroyed and remodeled the rest of the Citadel after the Turkish-style, and this is what remains overlooking Cairo today. 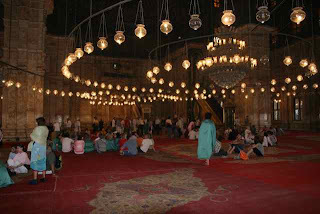 The interior of the mosque was crafted with Italian alabaster on the walls and columns, and Egyptian alabaster on the floors. There are 354 hanging glass globes illuminating everything. They initially housed candles, but now rely on electricity and lots of bulbs. Considering the law of averages, I would assume changing burned-out bulbs would be an infinite task. There are beautiful paintings and stained-glass windows on all sides, however we learned that depictions of humans or animals (anything with a soul) are not allowed in mosques, so the designs tend to be basic patterns, or flowers, or Arabic calligraphy. 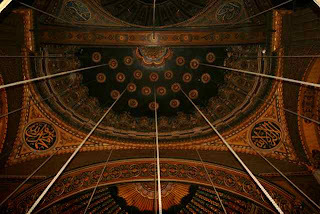 The original green and gold pulpit is still in place, but is no longer used. 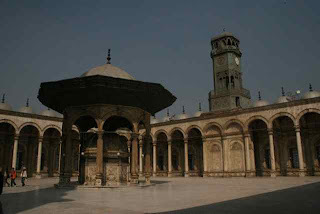 A second marble pulpit was installed farther back and in the center of the mosque for better acoustics. All mosques, regardless of where they are, are built to face Mecca. This way, when praying and facing the pulpit, you are also facing Mecca. 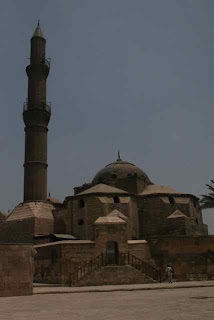 Because of this, all mosques in Cairo are built facing Northeast. We visited the Museum of Al Gawhara Palace, which was constructed by Mohammed Aly from 1811-1814 and was the primary residence before he had the Harem Palace built. In 1972 there was an electrical fire, however, and all the original furnishings and artwork were destroyed, so currently many of the rooms have been converted to administrative offices, but we were able to see two rooms that have been restored and furnished with articles taken from other palaces of the same era. This was where Aly is said to have arranged the massacre of the Mamluke leaders on March 1, 1811. He apparently invited all the Mamlukes to the palace to celebrate the proclamation of war on the Wahhabis in Arabia. Between 600 and 700 Mamlukes came and on the route to the palace, in a narrow road down from Mukatam Hill, they were ambushed and killed by Aly’s forces in what became known as the “Massacre of the Citadel.” It is told that one Mamluke, named Hasan, survived the massacre and escaped on his horse, however during the following week hundreds more were killed throughout Egypt, over 1,000 within the Citadel itself, and in total over 3,000 were killed. It was in Al Gawhara Palace, listening to the tales of slaughter, where the heat of the day started settling in and we all began the forehead dabbing gestures (there was no A/C and the open windows sometimes offered a slight breeze, but moreso they offered unfettered access to the hot air outside). We next explored the Military Museum, which was housed Harem Palace. This one, however, unlike Al Gawhara Palace, was in remarkable condition. The interior rooms had been restored beautifully, with high ceilings, intricate motifs stenciled on the walls and on all ceilings, gold accents, huge ballrooms, sweeping marble staircases. Definitely palatial. The contents of the museum were marginally interesting to me; I’m just not that intrigued by the history of Egyptian military uniforms or examining dioramas of historical battles fought (though they did have on display one of Tutankhamen’s original chariots, which was impressive). But in all honesty, I might have found it more interesting had the heat not been so distracting. At one point on the second floor, four of us decided it was more important to find a breeze than examine the exhibits, so in a bit of heat-induced panic, we raced through room after room until we all stood by the one window affording a cooler breeze. After this, we wandered through the small Carriage Museum, showing, shockingly enough, carriages. Again, heat stroke displaced any interest I might have had in these. I found myself more focused on making sure the 70-year-old woman didn’t slip on the wet floors. One method for attempting to cool things off here is to pour water on the floor and turn the fan on. However, in this case it just made the sweltering heat a secondary concern to slipping on the stone floors. By this point we were a sorry sight to behold, I’m sure. Our guide led us back through the compound offering to show us along the way a spot for great panoramic views of Cairo as we limped toward the “Transpurt” bus. She wasn’t wrong. 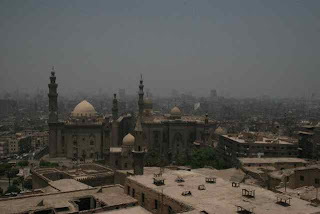 This is Cairo on a very hot and hazy day. 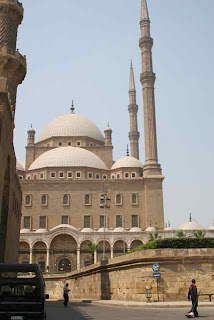 The two mosques in front are not connected to the Citadel, but the one on the left is where Sadat and the Shah of Iran are both interred (both of whom apparently died at the military hospital in Maadi). As we rode home in the life-giving comfort of the air-conditioned bus, I suddenly realized how smart my husband is. So I will return with him in the Fall, and will be able to thoroughly enjoy all that the Citadel can offer and not just be distracted by being so high above Cairo and all the more closer to the sun.